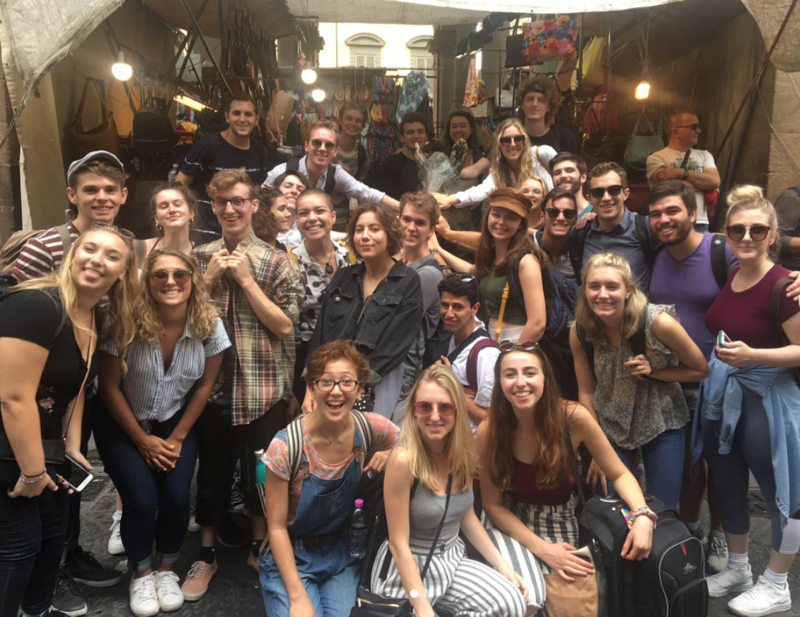 For our first ADALife Blog of the semester theatre students, Itai, Posie, Ivan, Hanah, and Jacob talk about their first week at the Accademia, some things that took them by surprise, and some goals they have while they’re here. Something that surprised me were the collaborative opportunities offered to us right off the bat. Within the first movement class we were pushed out of our comfort zones and worked with the entire class to move with each other in ways that many of us had never moved before. We learned how to feed off of one another to influence our physicality, then fed off of the next impulse to further the interaction. Later that day, barriers were broken between the theatre and music students in the form of a collabaret (collaborative cabaret), and both sections of the accademia dell’arte produced improvised art using both sound, movement, and narrative. Such experiences promise to make this semester one of the most interesting and fun yet. 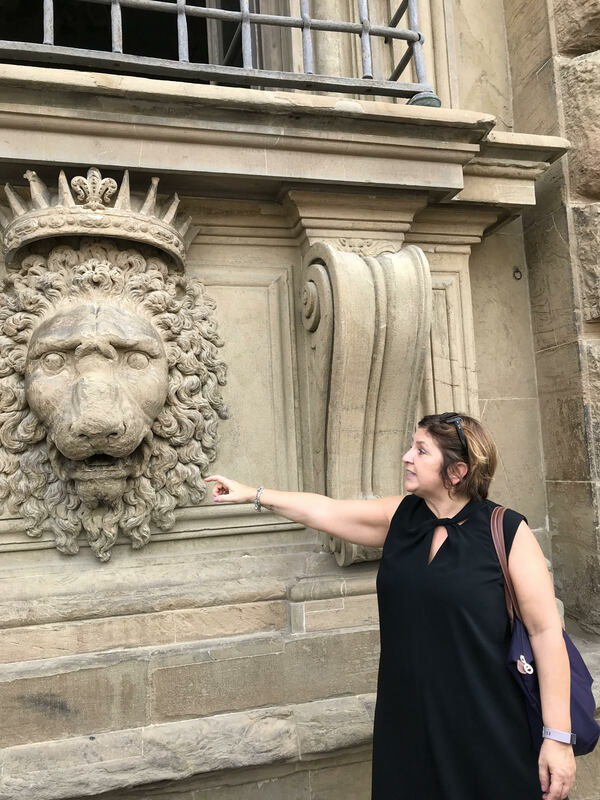 Director of student services, Monica Capacci, showing our students around Florence. Something that has surprised me about life at the Accademia is how stunning the sunsets are. Every single night, the roof of the teatrino becomes the perfect viewing spot to watch the sun disappear over Arezzo. The light takes on an ethereal quality that brings out the landmarks of the surrounding landscape, such as the cathedral and the mountains in the distance. I’m looking forward to watching many more Arezzo sunsets over the course of the semester—they remind me of how lucky I am to be able to study here. Today marks the start of our second week at Accademia Dell’Arte. The leaves are starting to change the morning floors becoming cool to the touch and already it is starting to feel like home. The spectacular view outside my window every morning hardly ever surprises me anymore. I can count on the perfect sky being a different beautiful hue as the hours pass by. Our field trip to Florence last friday, returning on the train, and walking up the hill to the villa felt oddly familiar. Each time I make the trek upwards, my legs gradually burn less, I breathe easier, and I feel more refreshed. By the time I look out over the aqueduct, the castle walls, to the bell tower so far away, I can exhale comfortably. This is home, the countryside of Italy, the birth of the arts. I am ready for whats to come. Something that surprised me in the short time being involved in this program is the efforts by the staff of both the theater program and the music program to get these two programs to work together and to collaborate to meet in some form of common ground. This started on night 3 when we met to collaborate with song and movement and made something special together. Doing this and establishing this bond of the two programs so early on in the process was so important to break the ice and get the two programs to merge in a way they know how. This is my goal for the semester, to meet people and to be pushed out of my comfort zone. at the beginning of this night i was sitting in the corner giving minimal participation, by the end I was up and moving with the rest of the program. Below is a video of the first collabaret meeting with all the theatre and music students! One of my main goals for this semester in Italy is allowing myself to stay truly present. It is so easy to let your brain race from one thought to the next , but it is important to take a step back and connect with the surrounding environment. Classes with Dory really help me with working towards this goal.